Hello everyone! Today I'm sharing a project that I posted over on The Greeting Farm Blog. Marie, the owner of The Greeting Farm, challenged the DT to try out some envelope art. I've seen some amazing envelopes out in blogland so this was just the push I needed to give it a try. 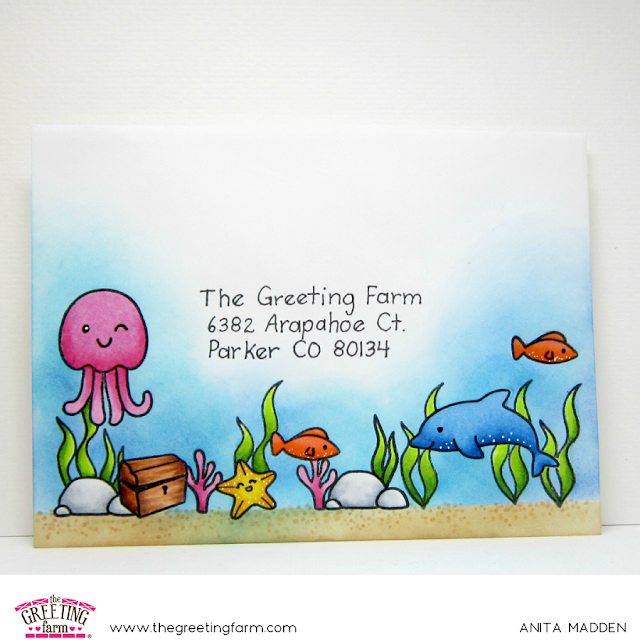 I used images from three different stamps sets to create my underwater scene: Make A Splash, Happy To Sea You, and Hands Down. I started by writing the address on my envelope so I would know where I could stamp the images. I stamped some of the images and then masked them in order to stamp the images in the background. I fussy cut masks for all of the images and sponged some Antique Linen and Gathered Twigs distress inks on the bottom of the envelope. Then I sponged Salty Ocean, Mermaid Lagoon, Peacock Feathers, and Blueprint Sketch to create the ocean. After my ink sponging was completed, I removed all the masks and colored the images with copics. Since my envelope wasn't really copic-friendly, I kept my shading to a minimum. While I'm glad I finally tried some envelope art, I will say it was very time-consuming (mostly because of all the masking) so it's probably not something I will do often lol. It's gorgeous! Envelope Art must be the new thing.